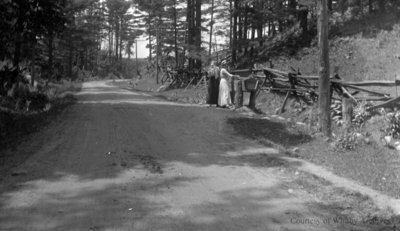 A black and white medium format negative of two unidentified women standing by a wooden fence on a dirt road. This negative has started to degrade. This negative was part of a collection of negatives found in the Archives storage room. Actual date of negative and photographer are unknown. The name on the negative envelope is Walinhouse, J. E.
Two Unidentified Women Standing By A Fence, c.1915, Photographer Unknown. Whitby Archives A2014_001_038.